Woolworths has revealed 500 jobs will go in back office and supply roles as part of an overhaul of its business amid tough competition in the retail industry. The retailer has announced that 30 stores will close, including 17 supermarkets in Australia, six supermarkets in New Zealand, four Woolworths metro stores and three hotels. These stores are all expected to shut before the end of the current financial year. Woolworths also said that it has “identified five Big W stores that are likely to close in the next three years based on current trading performance”. A further 34 stores across its broad portfolio are rated as under performing and where Woolworths said there is “currently significant uncertainty around whether we would renew the lease at the end of the lease term”. This includes 15 supermarkets in Australia and five metro stores. Woolworths is also writing down the value of store assets at another 18 Big W stores, in part due to “onerous lease obligations”. The supermarket giant also plans to close its Hume Distribution Centre in Victoria in the 2019 financial year. A further 1,000 workers will be moved from head office directly into the company’s business units. Woolworths chief executive Brad Banducci said the company had to make some tough decisions. “We are confident we are putting in place solid foundations for the future and early results give us confidence we are on the right track,” he said in a statement. Woolworths said it has also significantly slowed down the rollout of new supermarkets in Australia. “Most importantly we are deliberately slowing down the future pipeline of store openings and investing the capital we might have put in store openings into store renewals,” Mr Banducci told analysts on a conference call. The supermarket giant said the cost of restructuring will be $766 million, and nearly $1 billion before tax. It expects to make a pre-tax profit for 2016 of between $2.5 to $2.57 billion, but that does not include the nearly $1 billion in one-off write-downs. Woolworths has also incurred significant costs from its decision to exit its loss-making hardware business Masters. Budget department store Big W is expected to make a loss of up to $17 million this year. Online retailer Ezibuy could also be hived off, Mr Banducci said. “The synergies expected at the time Woolworths bought Ezibuy were not realised and the performance of that business has been below our expectations,” he said in a statement. 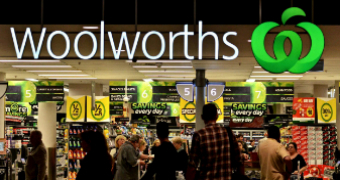 Woolworths has taken a $309 million write-down on the value of Ezibuy. Despite all the write-downs, investors reacted favourably to the plan to restructure the business, sending Woolworths shares soaring 8.4 per cent higher to $24.34 by 2:55pm (AEST). That is the biggest one-day gain for the stock, which trades under the ASX code WOW, in almost two decades. Woolworths shares are now trading at their highest level since the start of February, having hit a near-decade low of $20.50 less than three weeks ago. Fund manager Roger Montgomery said shareholders were welcoming a long overdue change in strategic direction, which may mean further shake-ups ahead for staff. “I do think this is just the start as the company implements its new strategic direction, that they will lose even more market share and maybe even more job losses to come,” he said. Mr Montgomery said the impact Aldi has had on Woolworths cannot be overstated. “If you look at Aldi’s success globally in every country that it’s entered except France, you’ll see there’s very little that incumbent supermarkets can actually do to fend off the attack,” he added. Posted on July 27, 2016, in ConspiracyOz Posts. Bookmark the permalink. Leave a comment.